The video broadcast by Qiao San Die went viral very quickly and, due to the highly inflammatory comments she made towards Tibetans, Tibetans online, both in Tibet and in exile, quickly broadcast their own responses voicing their anger. The amount of video responses to Qiao San Die’s broadcast by Tibetans in Tibet, especially among young Tibetans and students, was unprecedented. 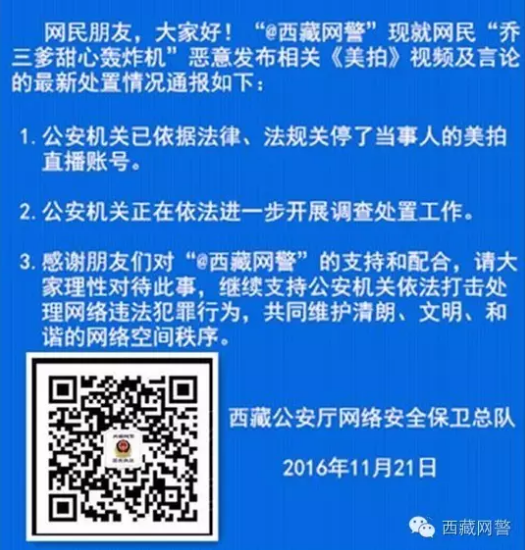 The WeChat post by Snow Lion Cultural Media below shows the actions that were taken by official bodies, the Tibet Internet Police and the app Meipai itself, to respond to Tibetan concerns and remove the video and the user. Lastly, a statement by the Shanghai Tibetan Student Association appeals for calm and urges Tibetans not to publicly mention Qiao San Die, who they claim was seeking attention and more online followers. Even though the controversy surrounding this incident has died down now and in internet terms is ancient history (ie five months old), it is still important to document these incidents and monitor official responses as well as those of netizens. Public Security has, in accordance with law, already closed down the Meipai live broadcast function of this user. Public Security has, in accordance with the law, started respective investigations into the matter. 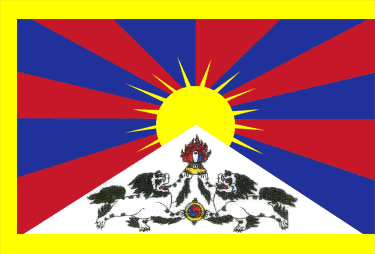 We thank you for supporting and cooperating with the “@Tibetan Internet Police”. We ask everyone to approach this matter in a reasonable manner and work together towards a clean, civilised and harmonious internet environment. On November 20, Meipai closed down this user’s account and on November 21, completely blocked this user. All her videos and messages have already been deleted and she is unable to operate any functions in her account. 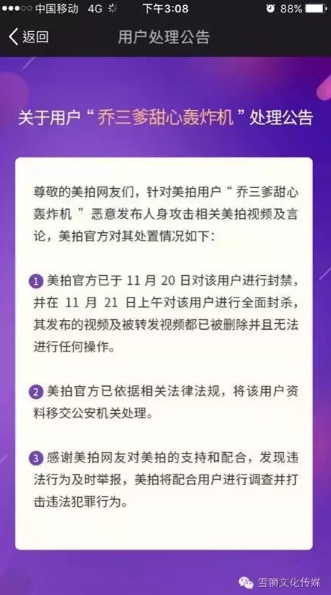 Meipai has, in accordance with the law, passed on the user’s information to Public Security for further investigation. We thank all Meipai users for their support and cooperation in immediately reporting any illegal behaviour. Meipai will try everything to help investigate and punish any illegal behaviour. 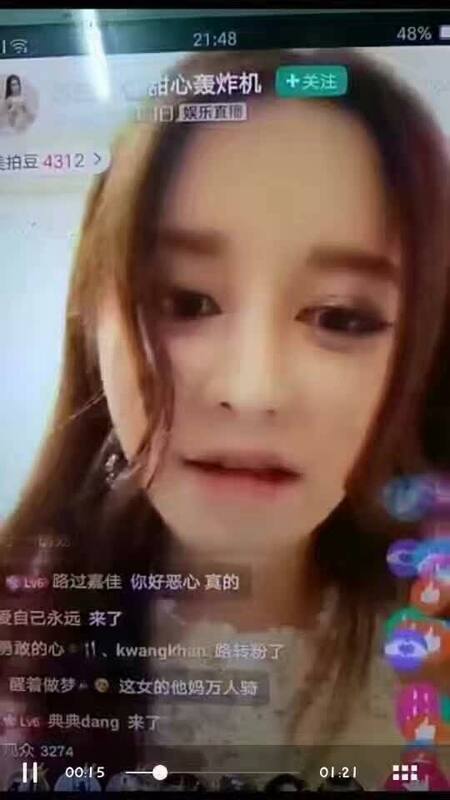 I believe you have all been extremely annoyed and angry by the Meipai website user with the ID “Qiao San Die 🐇 Sweet Bomber” (乔三爹🐇甜心轰炸机) who recklessly insulted rural people and us Tibetans in a live video broadcast. But in all your anger, have you ever thought about why she did this? When you saw her, didn’t this evoke a strangely familiar feeling? Indeed, just like it was the case with the “menthol balm incident”, she did these ridiculous things mainly to win more followers and have more traffic on her personal web page. Otherwise why would we have to “follow” her first in order to leave any comments on her page? So, my dear compatriots, to prevent her from getting what she wants, please don’t follow her and don’t send any comments or other messages concerning her on your WeChat Moments. To all human beings, we should calm down first and solve this issue in a reasonable manner. She lives in Shanghai, so the Shanghai Tibetan Student Association has already collected evidence and passed it on to the relevant departments; we are now waiting for results. Churchill once said that you will never reach your destination if you stop and throw stones at every dog that barks. I ask everyone to remember what I said: please don’t follow her or send her personal messages and comments and don’t mention her on your WeChat Moments page. If you have done, please delete any related content (because this could give her something to bite us back with) Please rest assured, our Shanghai Tibetan Student Association will provide all of you and our people with further information!